Join me for a tour of regional wineries in Northeast Indiana. I’ve got to admit, this is the kind of assignment I can really sink my teeth (and lips) into. Work. Work. Work. 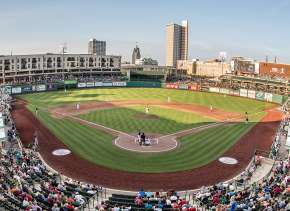 We’ll start in Fort Wayne, Indiana and move north, then west, but first, of course, we’ll need a designated driver. I’ve been to Two EE’s more than a few times. Set on a small hillside surrounded by 40 acres of trails and vineyards, it’s a great place to meet up with friends and family. We usually start in the modern and open 2,000 square-foot tasting room where one can taste two wines for free or sample a flight of six for $5. The fee is credited toward the purchase of three or more bottles of wine. Tastings are available daily from 11-7. I am a big fan of the white (dry) Traminette, and I’m not alone. It won Traminette of the Year at the 2018 Indy International Wine Competition. Their dessert ice wine also won Ice Wine of the Year and the (white table wine) Valvine Muscat won Wine of the Year. My friend, Marcia – who prefers sweet wine – tried the Plonqe&apos; (pronounced plank), a semi-sweet red that the tasting menu described as a “Pleasant Porch Pounder.” “Very good and plenty sweet,” was Marcia’s thumbs-up review. The staff, including Hanna, who waited on us, was very helpful and friendly even though they were getting ready to close. We had just enough time to go outside to the patio and enjoy our glasses of wine, which was great since the patio is one of my favorite features of the winery. Groups of people talked amongst themselves as the band – which had just finished playing - dismantled and packed up its equipment. The ambiance of soft lighting and an open-air patio make it easy to see why this is a favorite of locals and a must-stop for travelers. In addition to bottled wines, Two EE’s also has wine slushies, a dry-hopped hard cider, a sweet melon-flavored hard cider, bottled water, and sodas. Open seven days a week, the winery’s menu includes crackers, meat, olives, and other snacks. 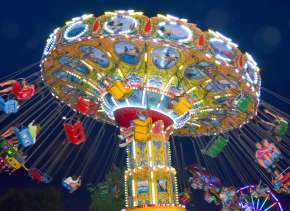 In addition, the owners contract with area food trucks to offer various culinary fare during special events. Looking for a party atmosphere? Look no farther than Country Heritage. Take some good wine and food, add a lot of people and you’ve got a party. With more than two dozen award-winning wines and spacious outdoor and indoor seating and amenities, Country Heritage offers the ingredients to make that happen. Inside the front door are a dining room, tasting bar, and gift shop. The back room features another bar and a large seating area. Outside is a gazebo surrounded by vineyards, which is where we sat. Adjacent to the gazebo is a large wrap around porch that overlooks a ginormous maze of multi-leveled seating areas with umbrella-topped patio tables and chairs, a band shell, food truck area and pizza, and snack concession building. Multiple walkways criss-cross green areas and the large boulders and beautiful masonry work add to the richness of the outdoor venue. The Fall Harvest, a semi-sweet, usually sells out sometime in December, according to our wine-tasting bartender, Carter. Another highly anticipated semi-sweet seasonal wine is the Jolly Juice, which will be released the day after Thanksgiving, Carter said. 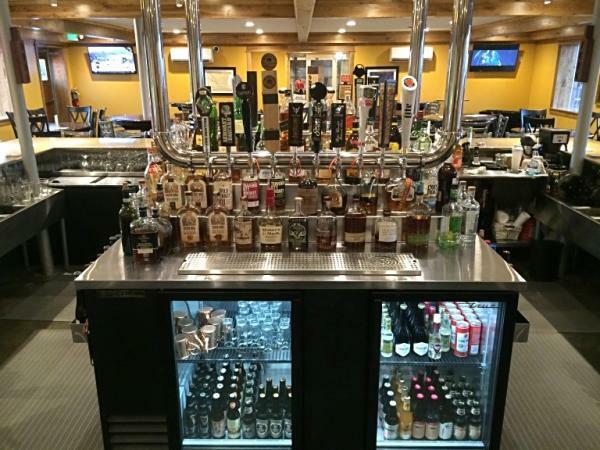 The menu also includes wine slushies, hard cider, and non-alcoholic beverages. In addition to the five bottles of Fall Harvest at our tables, was the tart, semi-sweet cranberry chosen by my daughter, Stacy – a very popular wine for Thanksgiving and Christmas, according to Carter. I –the dry drinker, chose the Marechal Foch 2016, a red estate grown with a vibrant cherry flavor. My sister, Margaret, ordered the Fall Harvest although she normally gets the Heritage Red and Heritage White. “They are just the right amount of sweet,” she said. Another reason Margaret likes Country Heritage wines? ”They have never given us a ‘wine hangover,’ “ she said. My niece, Chandler, liked the Fall Harvest and Jolly Juice best. “I like sweet wine, but these are not ‘too’ sweet,” Chandler said. A new store, Country Heritage Farm Market, fresh and locally grown produce, handcrafted fudge, and a deli and fresh meats counter, is located in a different building on the property. Both the market and the winery are open seven days a week. Entertainment throughout December is detailed on the winery website, as is the release dates of seasonal or new wines. 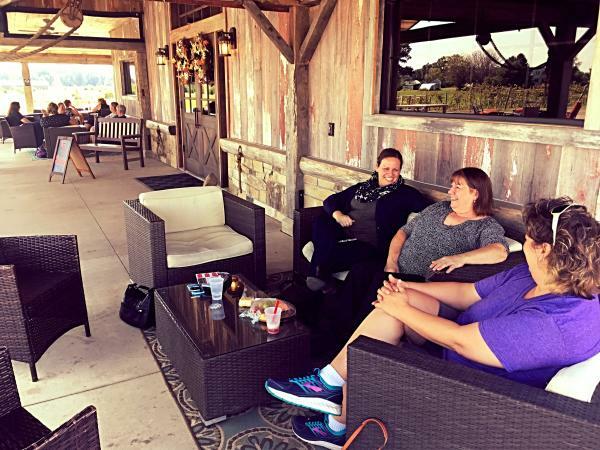 Free tours available on Saturdays at the top of the hour beginning at noon and ending at 6 p.m.
Friends Amy, Vicki, and Jen – from Fort Wayne, Auburn and Wolf Lake, respectively – spent a recent, sunny afternoon at Byler Lane Winery catching up with one another and sipping wine slushies. 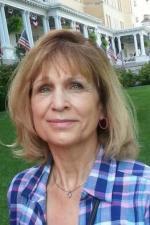 Vicki did not have to go far – she’s a neighbor of the winery, which is located at the end of a long lane bordered with vineyards in the midst of a scenic agricultural landscape. “I can see the winery from my house which is right down the road and I’ve known the (owners) Bylers and Lanes for some time,” Vicki said. Jen agreed. “It’s homey and comfortable and there’s no highway noise,” she said. The winery is open six days a week, closed on Mondays, and there is a bulk discount. Plus, many Byler Lane wines have earned medals of excellence at the Indy International Wine Competition. I started my tasting with two of the most requested dry reds – Chambourcin – French-oaked, chocolate and black cherry – and Kerry’s Red – a malbec, petite sirah blend. Both were excellent and I was hard-pressed to select a favorite of the two. 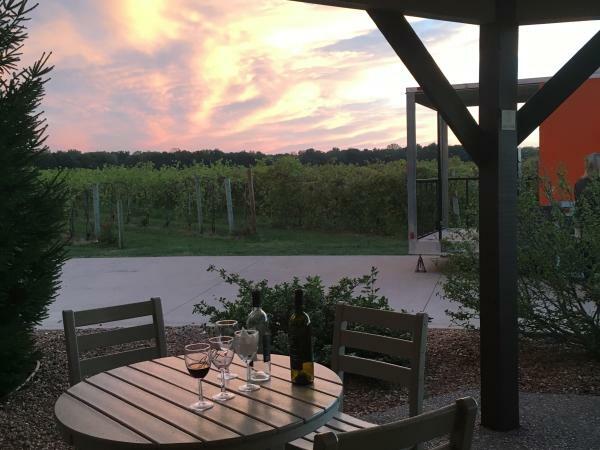 The winery offers seasonal wines that are favorites among the regular patrons, including the semi-sweet 2018 ACD Festival, released on Labor Day weekend and Harvest Moon, a pumpkin spice wine that was just released is a fall favorite. Both were excellent, especially if you like the sweeter wines. Two holiday favorites that will be released yet this fall include Rebel Currant, a sweet/tart currant berry wine, and a semi-sweet cranberry wine. The winery contracts with food trucks on occasion and also sells DeBrand Fine Chocolates, and meat and cheese trays. No outside food or beverages are permitted. For the entertainment schedule or the release announcements of seasonal wines go to the Byler Lane website or social media pages. Maybe you&apos;ve seen the billboards along I-69? 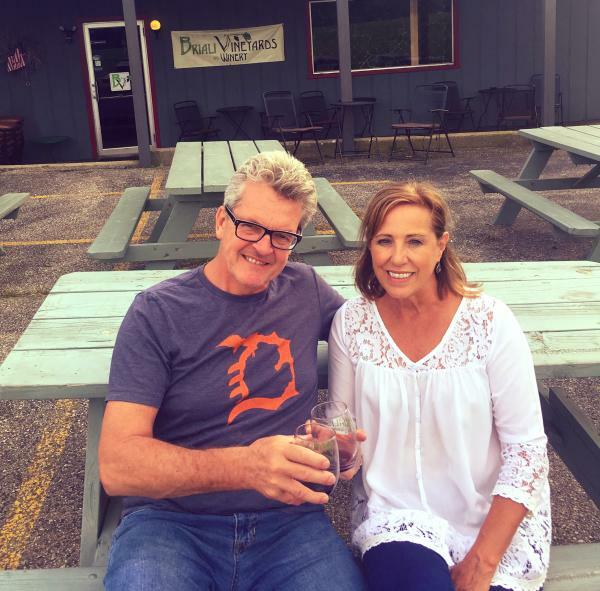 Alan and Brenda Hart’s 2-year-old winery was named 2018 Winery of the Year at the Indy International Wine Competition – no small feat. Because they make the wine in small batches, there is a constant release of new wines to try. And the trying is delicious. The top-selling red is a sweet number named Grandma’s Little Secret and dubbed “grape jelly in a glass.” I tried it – the tastings are free - and I know this would be a big hit with my nieces, who are partial to the sweet. The semi-sweet Edelweiss – flavors of grapefruit and a hint of pineapple - was wonderful, so no wonder it’s the top selling white wine. But the one I tasted and ended up purchasing a bottle to take home with me was the (dry, red) spicy Marquette, a bronze medal winner at the Indy International Wine Competition with the distinct taste of black pepper and cherry. Hartland will be releasing or bringing back six wines in the near future, including two new dry reds, two bourbon aged reds and a dry rosé. From now through the end of the year, Hartland is open seven days a week, but there are limited winter hours from January 2 to April 15. For more information on hours, joining the wine club or bulk discounts, visit Hartland&apos;s website or social media pages. Briali began with a strong dedication to environmental care and respect for nature with the planting and nurturing of more than 13 varieties of grapevines using biodynamic techniques - an advanced form of organic farming. Tastings are $5 and include four one-ounce pours and tasters can keep the stemless Briali wine glass. Located just off of I-69 on State Road 120, the site has been in Brian Moeller’s family for three generations. Brian’s grandparents operated a very successful restaurant, motel and golf course on the site decades ago. The winery is now located in the bottom level of what used to be the restaurant. 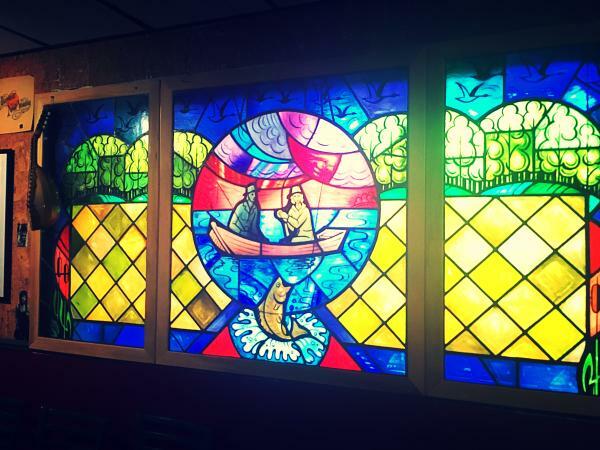 A beautiful, stained glass window depicting fishermen was salvaged from another building and is now the focal point of the winery. The tasting room/bar is cozy and exudes a warmth, encouraging strangers to talk and joke with each other across the bar. The operation is basically run by Brian and his girlfriend, Lauren – they even pick the grapes! - with a little seasonal help from a few friends. Lauren was tending bar the day I visited and I met up and talked with Brian as I was leaving. Because it’s a green operation and the wines frequently change, there were no print menu handouts. Wine selections are written and posted on a large sign at the end of the bar. The BB (bourbon barrel) Malbec – a dry red - was worth making another trip. First, I tried the regular Malbec, but a couple that was seated at the bar, Holly and David of Grand Rapids, Michigan, urged me to try the BB Malbec. And they were right – the bourbon barrel made for a smoother taste and the difference was perceptible. The BB Foch and Petit X Malbec were also very good. The sweet collection includes Dragon’s Red, Nouveau Red, and Geez White. The Dragon Pink is very sweet. There are also a variety of seasonal fruit wines. Several of the wines have garnered awards at the Indy International Wine Competition, including the Cabernet Franc BB. 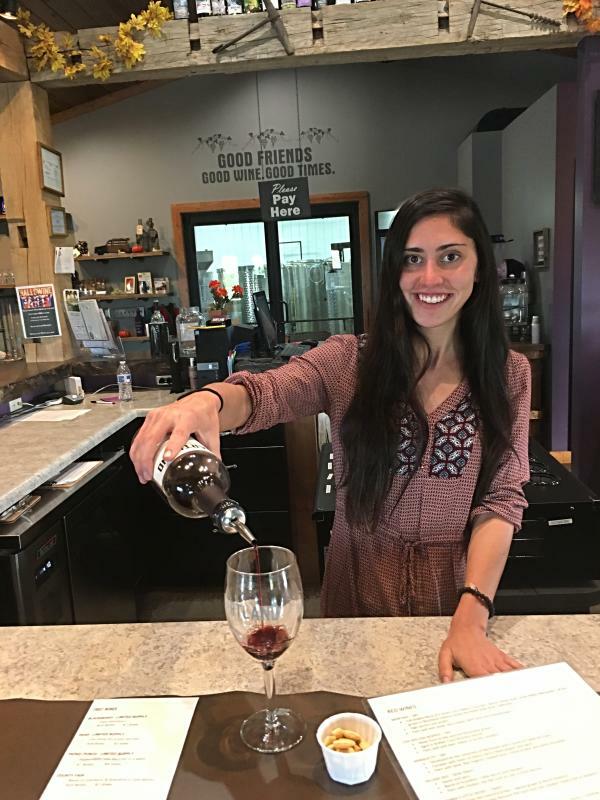 In the winter months, the winery is open Friday, Saturday and Sunday and there is usually karaoke, trivia games or live entertainment, Lauren said. The winery is closed Monday. When I did a wine tour column for a local newspaper in 2005 or ‘06, I had to make it a tri-state tour, because Satek (rhymes with attic) was the ONLY winery in northeast Indiana! In just a few short years, that number has grown to eleven. Satek remains a sentimental favorite. As evidence, I will return to buy a bottle of their excellent port to celebrate Thanksgiving and Christmas, and maybe a bottle, or two, of their top-selling dry white, Whisper, a medley of pineapple and lemon (bonus! – only $12.49 a bottle) and/or the KB Cabernet Sauvignon Reserve 2016, a blend of plum and bramble that is oaked for a year – and won Double Gold at the Indy International Wine Competition. Other Gold winners included the blackberry, dry rosé, and Autumn Classic. Speaking of Autumn Classic, for those of you who are sweeter than me (not a difficult thing to be) – this semi-sweet apple wine that is aged in cherry bitter barrels is like inhaling the crisp and vibrant essence of fall. Or try the 101 Lakes Red, the top-selling semi-sweet red – an explosion of semi-sweet Concord grapes in your mouth and senses – which also won Best of Class at the IIWC. More than half of the wines are made with Satek’s grapes as well as locally-grown fruit, said Kirk Etheridge, Satek’s assistant winemaker. 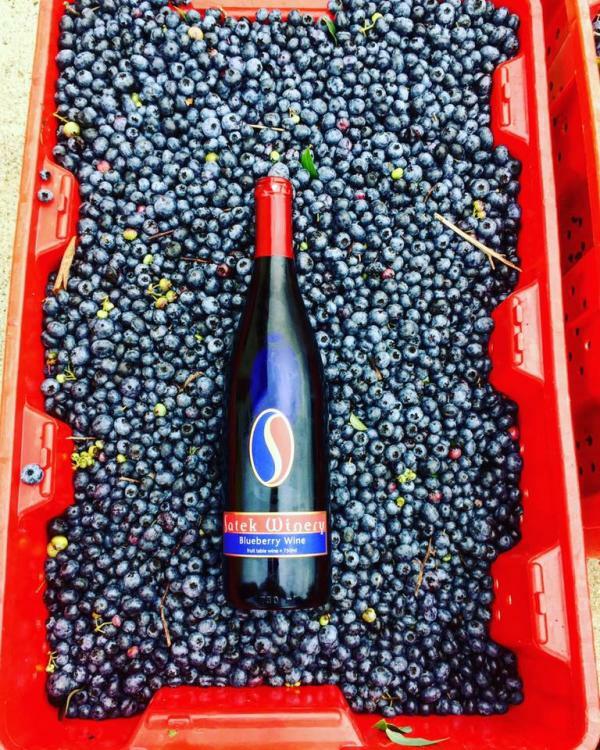 “Apples are from nearby Stroh’s Orchard and the seasonal blueberry wine is made from blueberries grown in Plymouth (home of the annual Blueberry Festival),” Etheridge said. Tastings are free and include eight samples. The winery hosts events and offers bulk discounts. Watch the winery’s website and social media for the release of the seasonal wines, such as the white dessert and blueberry wines. 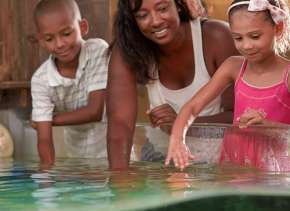 Tours are held on Saturdays and Sundays at 12:30, 2:30 and 3:30 with a maximum of 20 people per tour. Reservations are required – call 260-495-WINE (9463). I have been to several events – business meetings, a company Christmas party, and a wedding - at Sylvan Cellars Event Center and since my friend, Miriam, lives on Sylvan Lake, we’ve taken a few walks to the Sylvan Cellars tasting room. 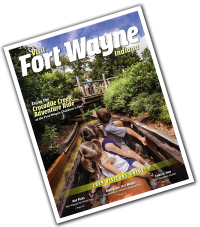 It’s worth the drive – 37 miles from Fort Wayne - just to check out the beautiful property and historical, landmark barn that houses the event center and tasting room, which is in the lower level. There is a large outside patio with plenty of seating, as well. Sylvan Cellars Tasting Room features a vast selection of handcrafted cocktails, craft beers, bottled and on tap, domestic beers, and an extensive international wine list. 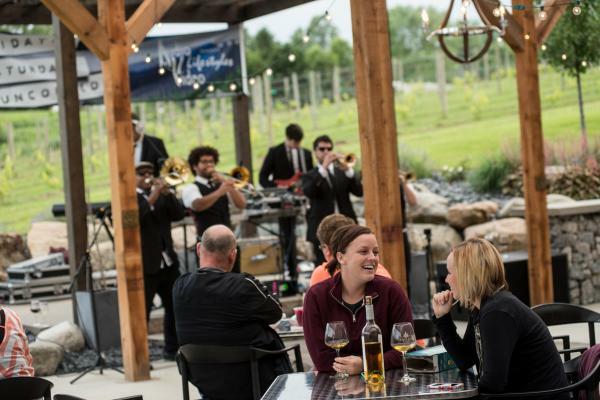 Live entertainment is featured throughout the year and the tasting room is open seven days a week. To check out the entertainment, hours, or for a list of beers, visit the center’s website or Facebook page.